Ernie Murakami is a now-retired doctor in Hope, British Columbia, Canada. He has many beliefs about Lyme disease that are not supported by scientific evidence. It was the opinion of the committee that Dr. Murakami lacked critical thinking and objectivity in his management and approach to Lyme disease. Dr. Murakami appeared to be a zealot. Dr. Murakami told the committee that, if he could not find another organic diagnosis for patients presenting with what was, in his opinion, third-stage Lyme disease, then he offered them treatment for Lyme disease. The committee was very concerned with that. Murakami stopped practicing medicine in 2008, saying that he was forced to retire due to pressure from the College. Murakami continues to spread propaganda for “chronic Lyme” on his web site, the Dr. E. Murakami Centre for Lyme. The conspiracy theorist group “Lyme Ontario” states “Dr. Ernie Murakami is a member of ILADS”. Children misdiagnosed with “chronic Lyme disease” are a particularly vulnerable group, and one of the references cited by the ILADS guidelines authors illustrated the dangers of misdiagnosis and gross and painful mistreatment. Experience from other clinicians has indicated that some children diagnosed as having “chronic Lyme disease” according to the ILADS criteria received oral and parenteral antibiotics for years, and had unnecessary interruption of schooling and social development, to the extent that there has been a loss of childhood. Serious physical harm to children from adverse events related to overuse of broad spectrum antibiotics for unsubstantiated Lyme disease has also been well-documented. Dr. Murakami has alone, treated and consulted with over 3000 people that have presented positive serology for Lyme and co-infections in Canada. In BC, less than 1 percent of ticks tested carry the bacteria that cause Lyme disease. The prevalence of B. burgdorferi in ticks in BC has remained constant over time and consistently low between 1996 and 2014. The geographic distribution of human Lyme disease and B. burgdorferi in ticks in BC has also remained constant during this time period. 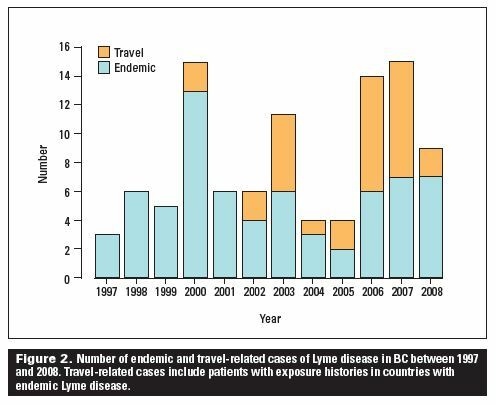 In 2011, scientists writing for the BC Medical Journal found very low incidence of Lyme disease in BC. They found only 93 reported cases over the 12 year period between 1997 and 2008. Out of the 93 reported cases, 1/3 were travel-related. Even considering under-reporting and traveling patients, Murakami’s diagnoses fly in the face of well-established science. Coinfections are even more rare in BC. Of course, in the cult of chronic Lyme, it is common for victims to be diagnosed with multiple fake coinfections. It seems there are many victims of chronic Lyme quackery in BC. Dr. David Patrick of the University of British Columbia tried to study the chronic Lyme phenomenon and found all 13 of the chronic Lyme patients enrolled in his trial had no evidence of ever having Lyme disease. All told, BC is yet another example of how chronic Lyme has nothing to do with ticks, but is a social phenomenon with many victims. British Columbia Medical Journal: Lyme disease in British Columbia: Are we really missing an epidemic?